Very little exists on its website, or anywhere else on the web, of the next-to-priceless jewels that make up the Stephen Russell collection. This wonderful curator of antique and fine jewelry is among the very few dealers whose devotion to discretion has helped retain their reputation as a cache of marvelous jewelry. To see the exemplary Stephen Russell collection, one must go about it the old-fashioned way: visit its brick-and-mortar shop in New York in person. 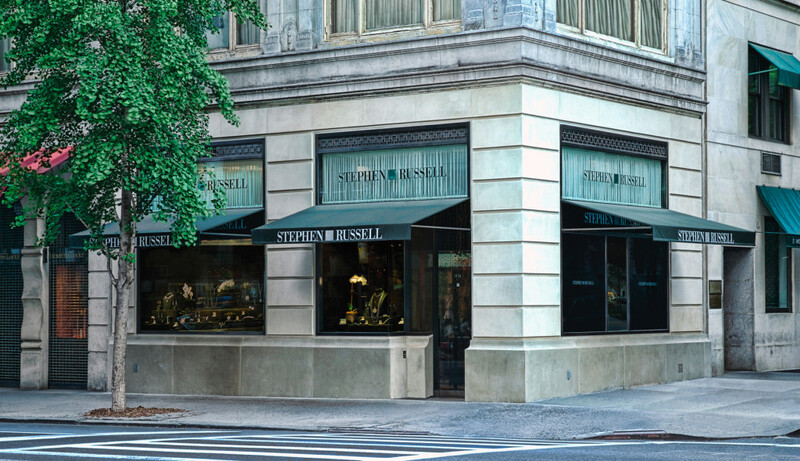 Situated on the corner of 76th Street and New York’s famed Madison Avenue, the luxury shopping strip with the world’s finest retail stores stacked one after another in the Upper East Side, the handsome tony shop of Stephen Russell houses some of the finest pieces of jewelry on earth. Since its establishment in 1984, countless extraordinary and important pieces by legendary jewelers, including Boivin, Boucheron, Cartier, Suzanne Belperron, and Van Cleef & Arpels, have passed through the hands of Stephen Russell’s visionary founders, Stephen Feuerman and Russell Zelenetz. A Rare Platinum & Diamond Art Deco Bracelet, Boucheron, Paris, Circa 1925. 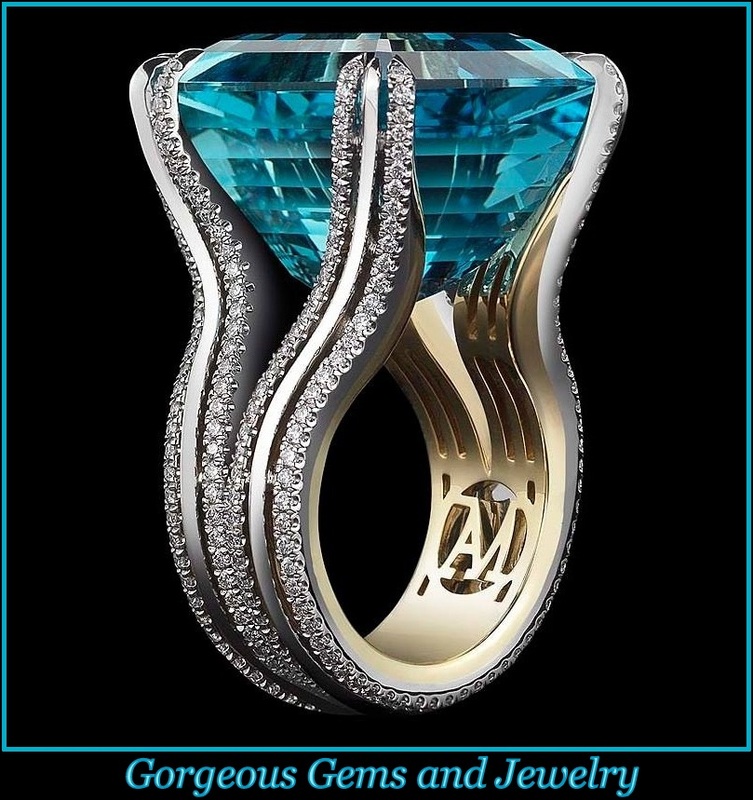 Between the two of them each possessing over 25 years of experience and their incalculable passion for superior antique jewelry, the dynamic duo pride their collection on the basis of their appreciation for and understanding of the fine craftsmanship, technical mastery and exquisite detail found in antique jewelry. Fastidious, well thought-out acquisitions of particular pieces from a wide variety of periods has formed a collection well worthy of its own museum exhibit. While the jewelry in the collection may be anywhere from several decades to even thousands of years old, every piece exudes a contemporary spirit, an important characteristic that keeps the collection consistently cohesive. Stephen Russell also boasts jewelry of its very own design, a refined contemporary collection inspired by antique cuts and settings as well as the classic lines of the Art Deco period with a subtle mix of modern style. 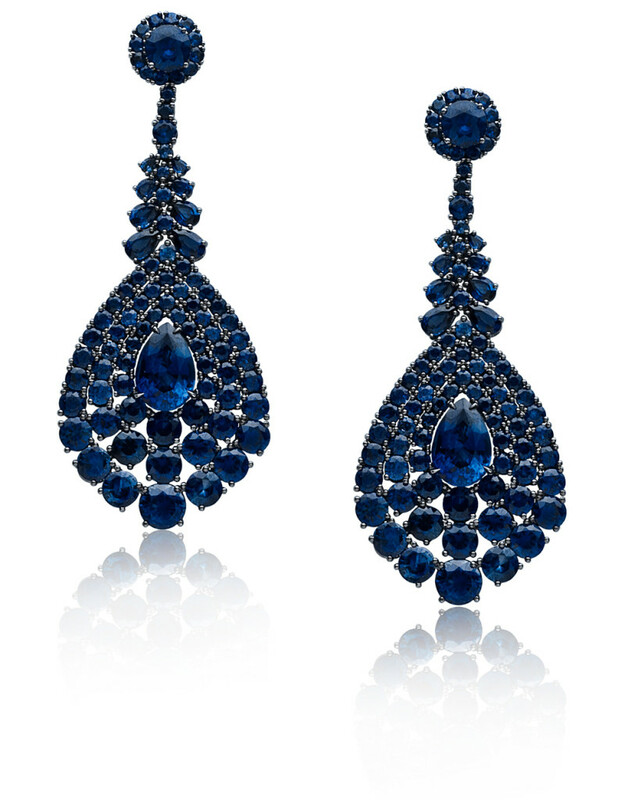 Sapphire and 18K Blackened Gold Earrings from the Stephen Russell Collection. Notably, Stephen Russel jewelry has been featured at select museum exhibitions and in catalogs, including theBijou Art Deco Et Avant-Garde exhibition at the Musée des Arts Décoratifs in Paris and Set in Style: The Jewelry of Van Cleef & Arpels at the Cooper-Hewitt, Nation Design Museum, in New York City. Stephen Russell also contributed to the recently published book Suzanne Belperron, by Sylvie Raulet and Olivier Baroin, which helped renew interest in the jeweler. 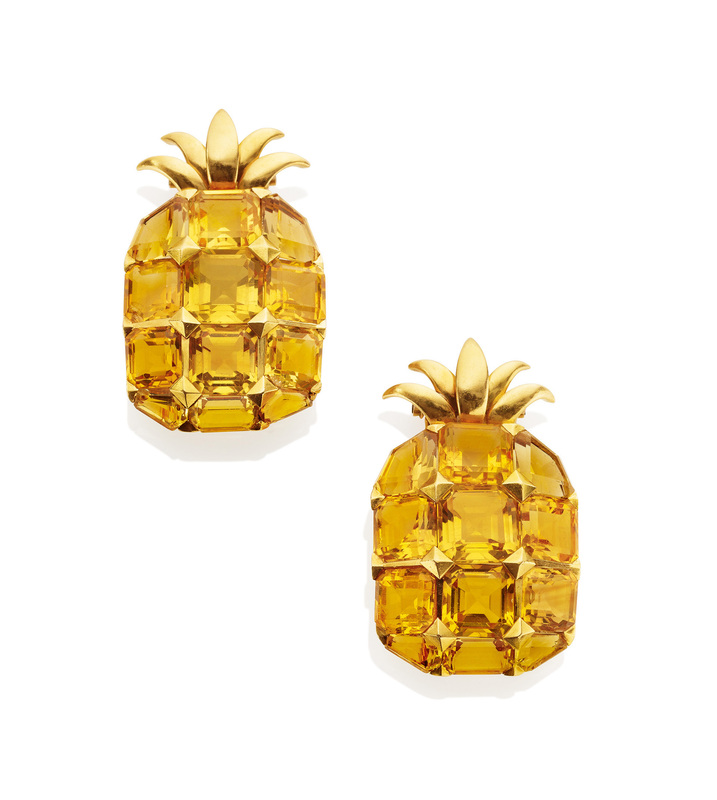 Citrine and Gold Pineapple Clip Brooches by Suzanne Belperron, circa 1942. 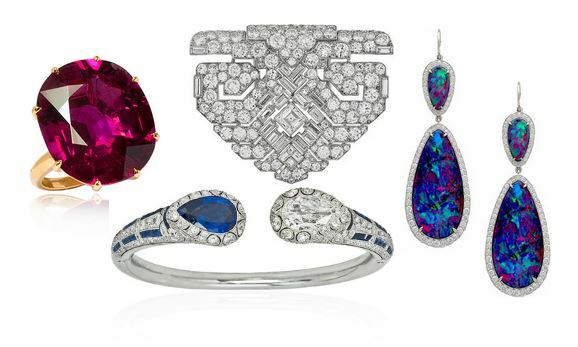 Images of some pieces in Stephen Russell’s collection of jewelry, both past and present. 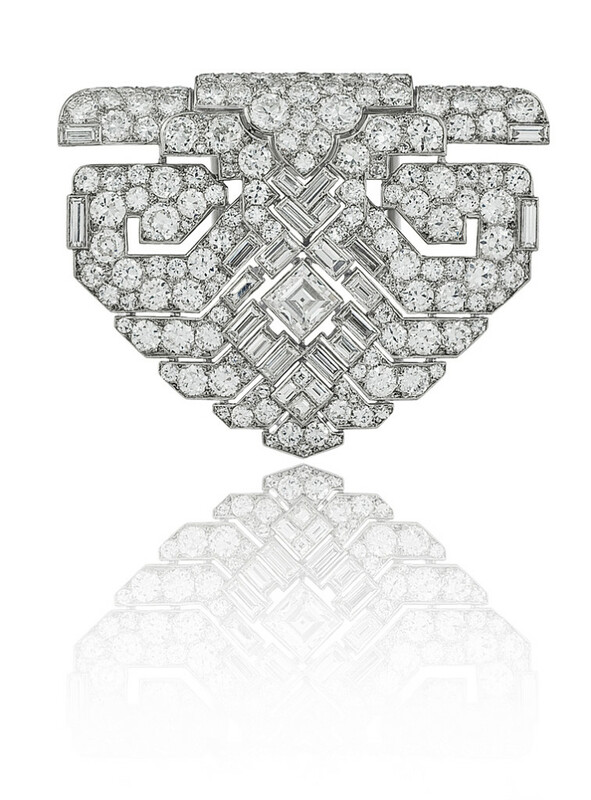 A Magnificent Platinum & Diamond Art Deco Clip by Cartier, London, circa 1930. 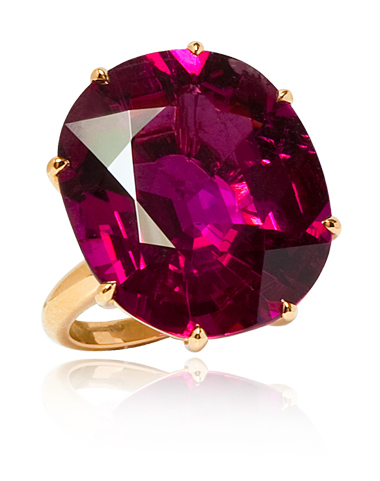 Rubelite Cocktail ring from the Stephen Russell Collection. 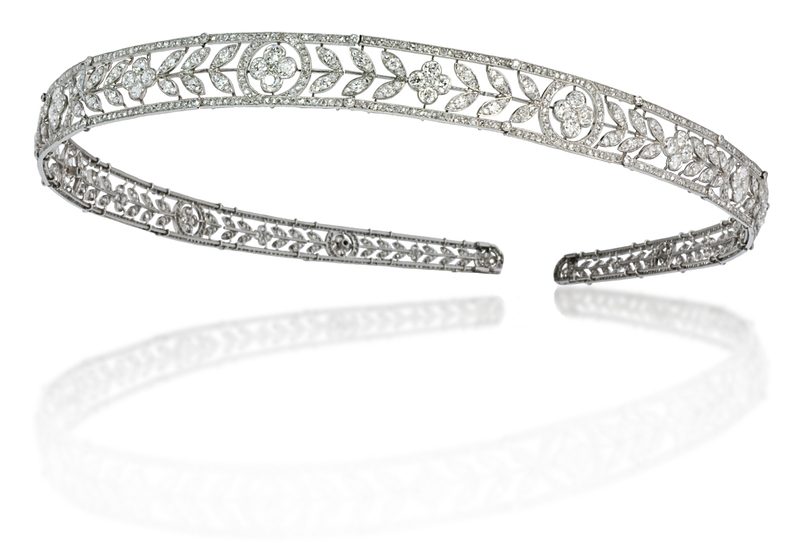 Platinum and Diamond Belle Epoque Bandeau/Headband by Boucheron, Paris, circa 1910. An assortment of Contemporary Gypsy Rings from the Stephen Russell Collection. This piece is exceptional for the way in which is transforms into many different jewels. The tassel is meant to be worn down the back. 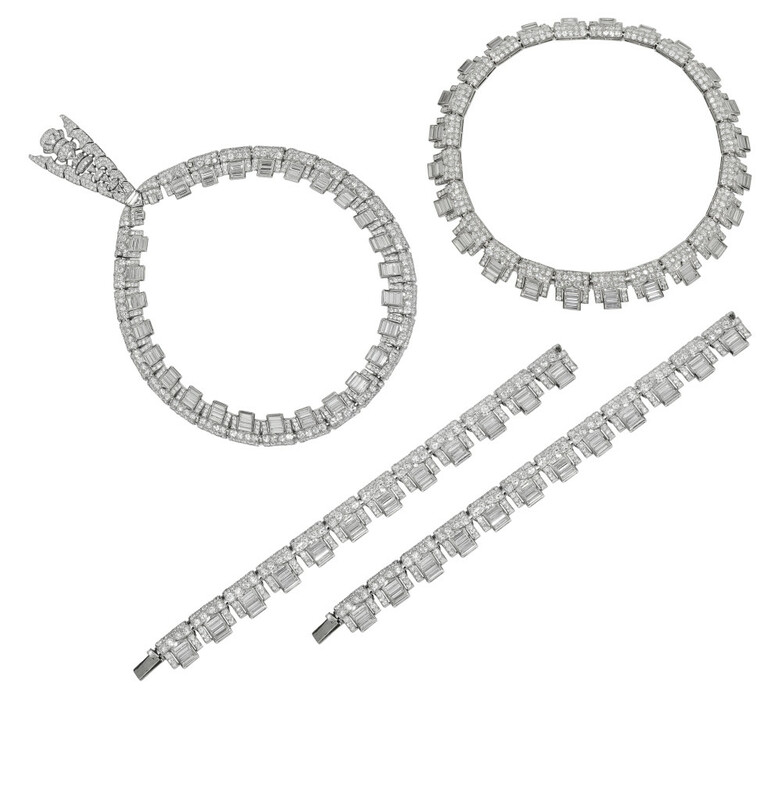 The necklace can also be worn without the tassel, in which case the orientation changes, and the baguettes face out. The piece can also be worn as two bracelets, either on one wrist, or two. Truly a magnificent jewel. 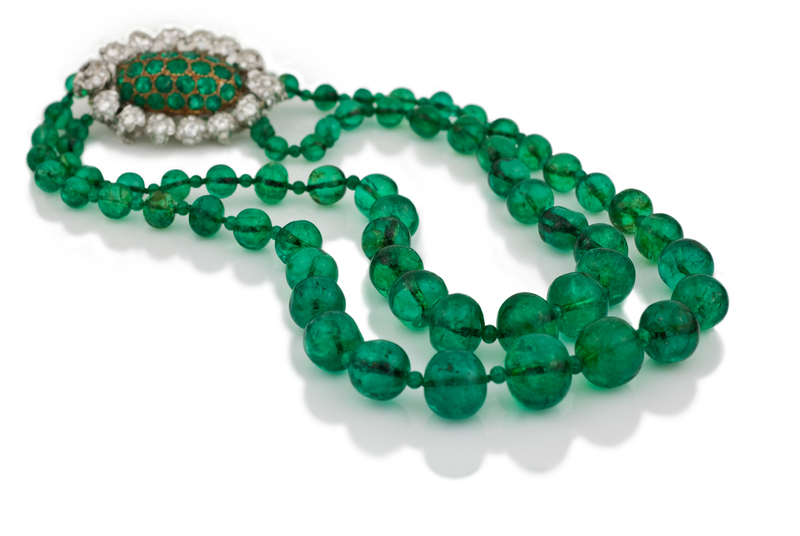 Magnificent Mughal-Style Emerald Bead Necklace. 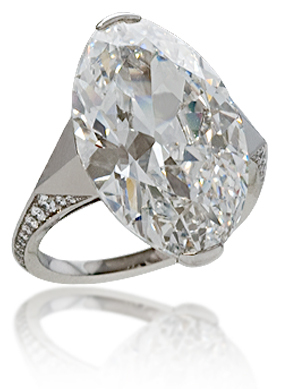 Navette-Cut Diamond Ring from the Stephen Russell Collection. 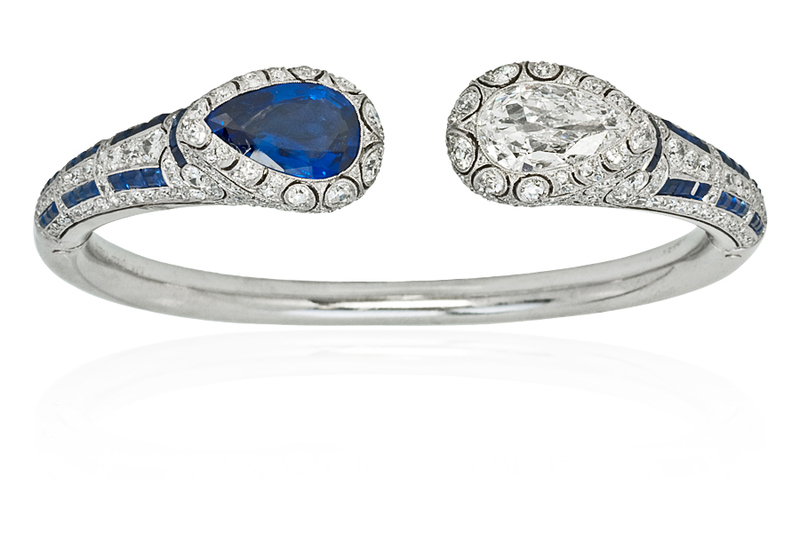 This one-of-a-kind diamond and sapphire bracelet was recently on display at the Musee des Arts Decoratifs at the popular exhibition, Set in Style: The Jewelry of Van Cleef & Arpels, on loan from the Stephen Russell Collection. 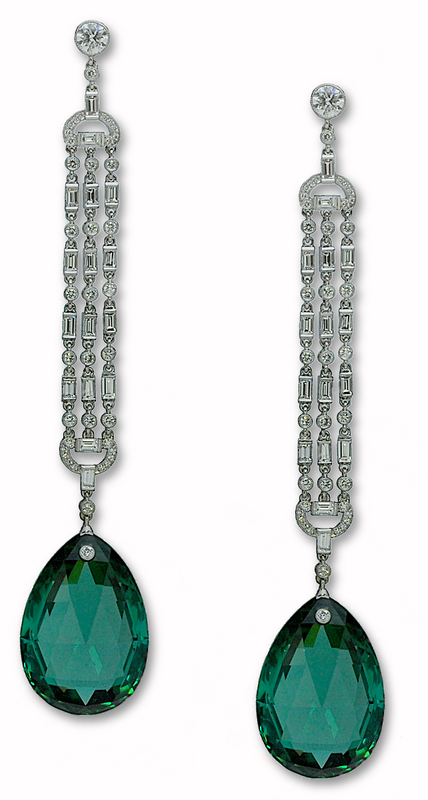 Platinum and Diamond Deco-Style Green Tourmaline Earrings from the Stephen Russell Collection. 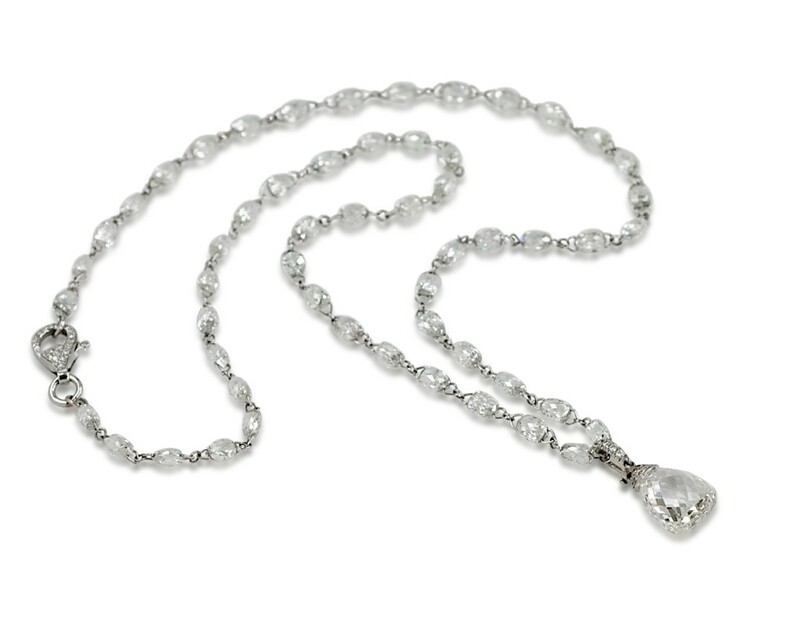 Diamond Briolette Necklace from the Stephen Russell Collection.